Creating an app can be a rewarding and exciting experience. Whether it is for personal enjoyment or financial gain, an app can be a challenging and worthwhile thing to do. There are many different application frameworks you can use, but only one is taking the world by storm right now, and that would be AngularJS. AngularJS is an open-source web application framework that had its initial release a few years ago. However, Angular is very trendy right now and is picking up steam. In fact, it is currently used by many popular sites including NBC, Intel, Walgreens, Wolfram Alpha and much more. However, if you want to host your Angular-made app on a server, it needs to be one that supports and is compatible with Angular applications. This is because it is a front-end framework, so it needs a back-end. Thankfully, because of the popularity and hype surrounding Angular in the last little while, many hosting providers offer Angular hosting. As a result, you have a tough choice to make. So, we’ve looked for the available Angular hosting options out there for you. While they work for AngularJS, some of the following providers offer you other types of hosting, including WordPress hosting. Being that WordPress is incredibly popular and common for website building, there is a chance you may also be interested in the best hosting providers for WordPress. 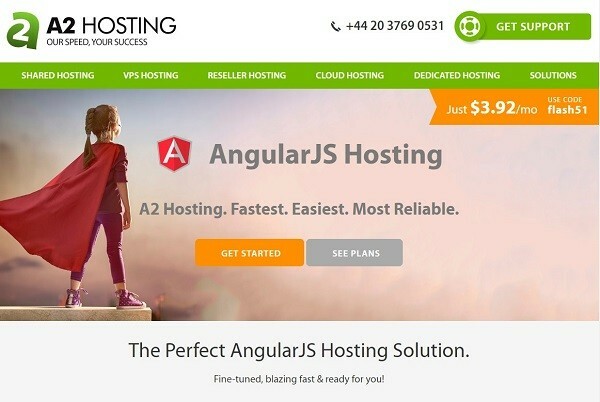 Without any further ado, let’s take a look at the best hosting providers for AngularJS. For more than a decade, A2 Hosting has been among the best and most popular hosting providers in the States. They have been a quality service in a wide variety of areas, so it is no surprise that they have capitalized on this craze surrounding AngularJS. They have an entire page dedicated to AngularJS that goes over many different features. They offer an extremely simple setup and pride themselves on their high performance and security. All in all, this is among the best options for hosting you Angular app and their plans are also quite cheap, starting at around $5 a month. Opened in 2011, Firebase doesn’t only help people build apps, it also helps with hosting. It is designed to host client-side applications and Firebase handles all the infrastructure and server management for you. Best of all, the app has a free option that is well-featured. However, if your app starts to grow and you need more storage and features, there is the option to pay either $25 a month or pay as you go, if you prefer that method. Firebase even has AngularFire, which is the officially supported AngularJS binding for Firebase. Heroku was among the first cloud platforms and has been around for nearly a decade now. It supports many different languages and frameworks, so is a popular option. This host also helps you only have to worry about the actual coding of your app, and not have to consider infostructure. There is a free version you can use, but there are major drawbacks such as the app sleeping after 30 minutes of inactivity and more. Thankfully, there are paid versions that range from $7-$500 a month. Docker has only been around for a few years but is one of the best options for hosting your AngularJS application. Docker deploys your application into software containers and makes sure your application will run the same, no matter what environment it is in. While there is a free version of Docker, you can also purchase plans that go up to $200 a month. Amazon Web Services is a suite of cloud-computing services (including hosting), that has been around since 2006. While other hosting options may have restrictions, this app allows you to fully customize in any way that you would like. So while it is flexible, it can also be a bit more difficult to manage as a result. There is an option to try it for free, but after a while, you will have to pay. The payment is very flexible and can vary based on how you pay and how many features and options you use or need. Hoopla Hosting are specialists in all things hosting and have many different services that make sure you are getting exactly what you need. Just like A2 Hosting, they have taken advantage of the popularity of AngularJS recently and have a whole page dedicated to it. They features of their service include extensibility, localization, and server communication. Their plans are also quite affordable and start from only $5.95 a month. It would be useful to learn about the actual experience you had with hosting providers so far. How is their support, what issues did you encounter? Let us know in the comments! Thank you very much for the information we provided. nice post, that’s what I was looking for, what a material!